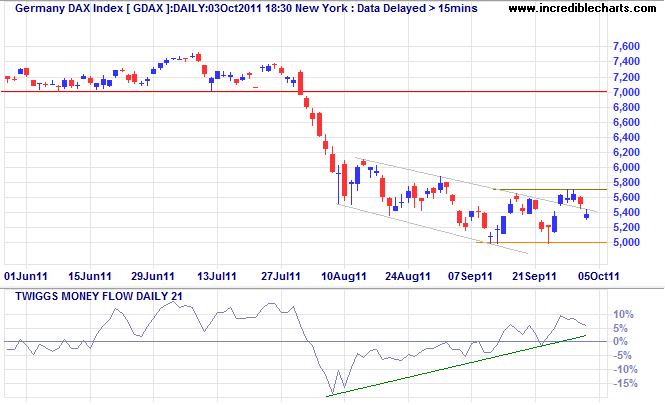 Germany's DAX index displays similar medium-term buying pressure on 21-day Twiggs Money Flow. Respect of support at 5000 is likely and recovery above 5700 would indicate another bear rally. 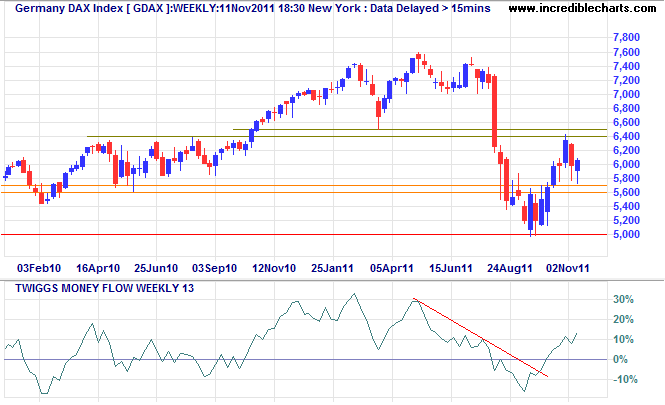 Germany's DAX is starting to rally on the weekly chart, with 13-week Twiggs Money Flow indicating medium-term buying pressure. Expect a test of 6000, but again we are in a primary down-trend, and another test of 5000 is likely. 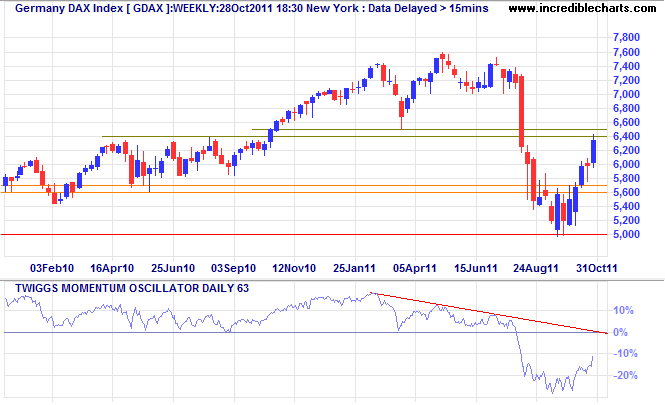 Failure of support would signal a decline to 4000. Oct. 13 (Bloomberg) -- Investors are paying the biggest premium since February 2008 to insure against losses in Germany’s stock market as the nation’s cost to shield Europe in the debt crisis grows. Implied volatility for iShares MSCI Germany Index Fund contracts expiring in three months was 1.36 times higher yesterday than the level for the iShares MSCI EAFE Index Fund, which tracks nations throughout Europe, data compiled by Bloomberg show. The ratio has climbed from the 2011 average of 1.15 even as the DAX Index rose 15 percent since Oct. 4, the biggest gain since 2008. German Chancellor Angela Merkel said Oct. 9 that European leaders will do “everything necessary” to ensure banks have enough capital. Her nation is the biggest economy in the region and the largest contributor to the European Financial Stability Facility. German lawmakers voted on Sept. 29 to raise the country’s contribution to 211 billion euros ($291 billion) from 123 billion euros. Options investors are driving up the cost of protection from German losses as global equities surge the most since March 2009 on speculation European leaders will take action to end the sovereign debt crisis. The MSCI All-Country World Index rose 9.6 percent through yesterday since falling to a 15-month low on Oct. 4. The implied-volatility ratio between the iShares exchange-traded funds for Germany and Europe has risen from 1.20 on Oct. 3, which was the lowest level since Aug. 25, Bloomberg data show. The ETFs trade in the U.S.
Stocks surged after Merkel and French President Nicolas Sarkozy said Oct. 9 that they will deliver a plan to recapitalize banks and address the Greek debt crisis by Nov. 3. Yesterday, European Commission President Jose Barroso called for the reinforcement of banks, the payout of a sixth loan to Greece and a faster start for a permanent rescue fund. The euro zone is Germany’s biggest export market. Valuations for German equities may be low enough to spur a rally. The price-earnings ratio for the DAX Index was 13 percent less yesterday than the MSCI All-Country World Index’s multiple. While it was lower last month, falling 24 percent below on Sept. 12, it’s still at a discount last seen in 2008, according to data compiled by Bloomberg. “As value investors, we like to invest in Germany at the moment because the stocks there are extremely cheap,” Herbert Perus, head of global equities at Raiffeisen Capital Management, said in a phone interview from Vienna yesterday. Price-earnings ratios are falling as German unemployment reached the lowest level since the country’s reunification two decades ago. The jobless rate dropped to 6.9 percent in September from 7 percent in August. 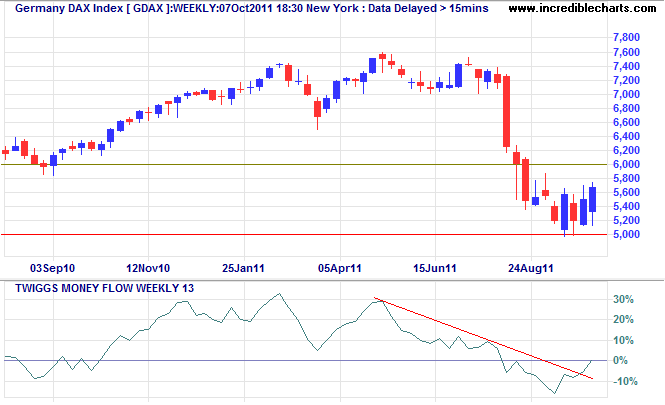 That contrasts with the 9.1 percent unemployment rate in the U.S.
Germany's DAX is testing resistance at 6500. Retracement would test support at 5600. A 63-day Twiggs Momentum peak that respects the zero line would warn that the bear market will continue. Mai is pay trade karne pasand nahi karta kiu k risk factor boht hi zada hojata ha. Mai sirf currency pairs ko like karta hon aur woh bhe khas tor pay EUR/USD jesi jis se trading karne mai boht asani hojati ha aur risk bhe nahi rehta opar se OctaFX broker k hone se aur madad mil jati ha in k low spread ki waja se jo sirf 0.2 pips ha aur trading platform bhe boht acha ha jis mai kabhi delay or re-quotes ka masla nahi hota.